The Italian Fasci of Combat (Italian: Fasci Italiani di Combattimento, FIC), until 1919 called Fasci of Revolutionary Action (Italian: Fasci d'Azione Rivoluzionaria, FAR), was an Italian fascio organization, created by Benito Mussolini in 1914. It was founded as a merger of two other movements: the Fasci d'Azione Internazionalista and a previous group he started called the Fasci Autonomi d'Azione Rivoluzionaria. In 1915, members of the Fasci began to officially refer to themselves as "Fascists". It denounced Marxism, but asserted that it supported socialism, using the famous quote by French socialist Louis Auguste Blanqui, "He who has iron has bread" on the title page of its newspaper, Il Popolo d'Italia. The Fasci was republican and Mussolini spoke of his desire that the war would "perhaps see a few more crowns fall to pieces", and in April 1915 Mussolini accused Italy's King Victor Emmanuel III of being a pro-German "Philistine" and accusing him of being "foreign" and for allegedly being a "neutralist". Due to Mussolini's support of Italian intervention in the then-ongoing World War I, he received financial support from Ansaldo (an armaments firm) and other companies. In 1917, Mussolini was allegedly supported by the British Directorate of Military Intelligence, with Mussolini supposedly being paid a £100 weekly wage; this help is said to have been authorised by Sir Samuel Hoare. However, regardless of the financial support he accepted for his pro-interventionist stance, Mussolini's socialist critics noted that Mussolini was free to write whatever he wished in his newspaper Il Popolo d'Italia, without prior sanctioning by his financial backers. The first meeting of the Fasci d'Azione Rivoluzionaria was held on 24 January 1915. At the meeting Mussolini declared that it was necessary for Europe to resolve its national problems - including national borders - of Italy and elsewhere "for the ideals of justice and liberty for which oppressed peoples must acquire the right to belong to those national communities from which they descended". Amidst discussion on the question of irredentism, Mussolini noted from the proceedings of the members that "the difficult question of irredentism was posed and resolved in the ambit of ideals of socialism and liberty which do not however exclude the safeguarding of a positive national interest". In March 1915, Mussolini declared the movement's irredentist stance towards Trieste, in which he stated that Trieste "must be, and will be Italian through war against the Austrians and, if necessary, against the Slavs". In an article on 6 April 1915, Mussolini addressed the movement's irredentist stance towards Dalmatia, arguing that Italy should not annex all of Dalmatia because claims that it had a majority of Italian speakers was "not a good enough reason to claim exclusive possession of all of Dalmatia" It did support Italy annexing a vast section of Dalmatia including its entire archipelago. The Fasci received ideological influence from other members than Mussolini, such as Prezzolini, who had previously been a member of the Italian Nationalist Association. Prezzolini was impressed by Mussolini, and in late 1914 joined Il Popolo d'Italia to write for it. On 11 April 1915 during an interventionist demonstration that was confronted by neutralist PSI members, Italian state police killed one man, an electrician named Innocente Marcora. Both interventionists and neutralists were outraged by the man's death. The Fasci d'Azione Rivoluzionaria who by then referred to themselves as "Fascists", took part in a joint neutralist-interventionist work stoppage. On 23 March 1919, the Fasci d'Azione Rivoluzionaria was renamed in Fasci Italiani da Combattimento. In 1919, the Treaty of Versailles resulted in Italy obtaining Southern Tyrol, Trentino, Istria and Trieste from Austria. However, Italy also wanted Fiume and the region of Dalmatia on the Adriatic coast, hence they felt treated unfairly. 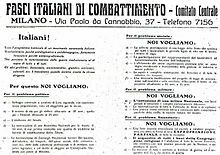 In March 1919, Mussolini set up the Fasci di Combattimenti (the fighting group), which galvanised the support of the disgruntled, unemployed war veterans. The Arditi, (The blackshirts, from the Italian commandos) were angry about the problems in Italy. Mussolini sympathised with them, claiming he shared their war experiences, hence they joined the Fasci, eventually becoming the MVSN. In the election of 1919, Mussolini and his party put forth a “decidedly leftist” and anti-clerical program which called for higher inheritance and capital-gains taxes and the ousting of the monarchy. He also proposed an electoral alliance with the socialists and other parties on the left, but was ignored over concerns that he would be a liability with the voters. During the election, Mussolini campaigned as the “Lenin of Italy” in an effort to “out-socialist the socialists.” Mussolini and his party failed miserably against the socialists who garnered forty times as many votes, an election so dismal that even in Mussolini’s home village of Predappio, not a single person voted for him. In a mock funeral procession after the election, members of Mussolini’s former Italian Socialist Party, carried a coffin that bore Mussolini’s name, parading it past his apartment to symbolize the end of his political career. Due to the disastrous results in the November 1919 election, Mussolini contemplated a name change for his Fascist party. By 1921, Mussolini favored a plan to rename the PFR and the Fasci Italiani di Combattimento to the “Fascist Labor Party” or “National Labor Party” at the Third Fascist Congress in Rome (November 7-10, 1921), in an effort to maintain his reputation as being loyal to the left-wing tradition of supporting trade unionism. Mussolini envisaged a more successful political party if it was based on a fascist coalition of labor syndicates. This alliance with socialists and labor was described as a sort of “nationalist-leftist coalition government”, but was opposed by both more conservative fascist members and the governing Italian Liberal Party of Giovanni Giolitti, who already had decided to include the Fascists in their National Blocs. In 1921, this fascio would be transformed into the National Fascist Party (Italian: Partito Nazionale Fascista, PNF). Mussolini combined ideologies from a few different political parties. He started his political life as a socialist, eventually editor of the socialist magazine Avanti, but was expelled when he supported intervention in World War I. He then started a group called the Fascio di Combattimento (League of Combat), which at first didn't gain much popularity. In 1919, a three-party government was formed, leaning toward a democratic side of government (National Fascist Party). The Fasci was strongly based on Mazzinian politics, such as following Mazzini's denouncement of irreligious, non-mystic, class conflict-based socialism, and in particular, Mazzini's theme of mobilizing the masses based on faith rather than materialism. In March 1915, Mussolini described Mazzini and other Italian patriots as having "awoken" Italians in Risorgimento, who up to then had been a "sleeping people". Mussolini like Mazzini accused conventional socialists for being dogmatic and in December 1914 had criticized the Italian Socialist Party (PSI) for their association with Marxism that Mussolini declared had become obsolete; and made a list of socialist figures ranging from the top of admirable socialist figures like Mazzini, Proudhon, Bakunin, Fourier, and Saint-Simon at the top to Marx at the bottom. He said that he and other Italian interventionist socialists sought to "repudiate Marx" and "return to Mazzini". This perception of Mazzini by Mussolini was influenced by Mussolini's idealization of philosopher Friedrich Nietzsche's übermensch and his idealization of revolutionary syndicalist Georges Sorel. In a 1909 review of Sorel's works, Mussolini indicated that he became a syndicalist when Sorel said "we syndicalists". ^ Zeev Sternhell. The Birth of Fascist Ideology. P. 303. ^ a b c Paul O'Brien. Mussolini in the First World War: The Journalist, The Soldier, The Fascist. Pp. 52. ^ a b c d e Paul O'Brien. Mussolini in the First World War: The Journalist, The Soldier, The Fascist. Pp. 42. ^ Paul O'Brien. Mussolini in the First World War: The Journalist, The Soldier, The Fascist. Pp. 52-53. ^ Paul O'Brien. Mussolini in the First World War: The Journalist, The Soldier, The Fascist. Pp. 37. ^ a b c Paul O'Brien. Mussolini in the First World War: The Journalist, The Soldier, The Fascist. Pp. 41. ^ a b c Paul O'Brien. Mussolini in the First World War: The Journalist, The Soldier, The Fascist. Pp. 49. ^ a b c d e Paul O'Brien. Mussolini in the First World War: The Journalist, The Soldier, The Fascist. Pp. 44. This page was last edited on 16 April 2019, at 21:06 (UTC).